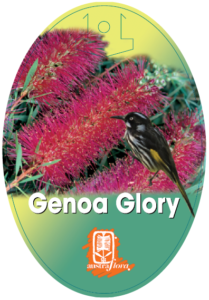 If you’re wanting a mid-sized shrub for screening or hedging, or a cluster to catch the eye at the bottom of the garden, Genoa Glory will do the trick. 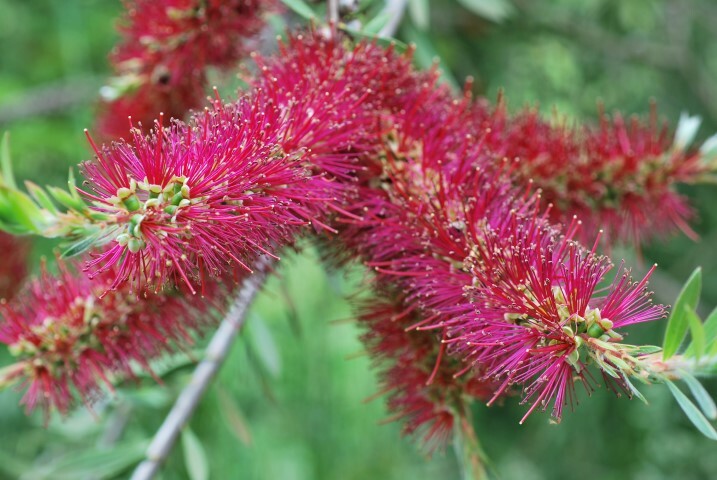 In spring, it’s loaded with purple-pink brushes that have a lustre you’d expect to see in a ruby or an amethyst. Callistemons have this special character; an inner glow which enhances a mere ‘colour’ to something extraordinary. The sight is even more entrancing when the honeyeaters are hanging off the brushes ~ they too can’t get enough. Easily grown in cool to warm climates, in all soils (except very alkaline) and tolerant of quite wet to quite dry conditions, it will do well by the coast and copes with moderate frosts. For truly spectacular flowering, full sun is best but even half a day of sunshine will keep it and the birds happy. Prune hard after flowering; new growth and even more flowers will flourish.